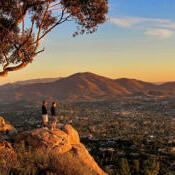 About 17 miles east of downtown San Diego is Spring Valley, the largest unincorporated community in the county. The Spring Valley community planning area encompasses about 11 square miles with a mix of single-family and multifamily residences, small, family-owned businesses and heavy industrial. Spring Valley neighborhoods include Bancroft, Brookside, Casa de Oro, La Presa and Dictionary Hill. (Originally called Lookout Hill, legend has it that the area got its name from the sale of lots, when a dictionary or encyclopedia was given to each buyer.) Some consider greater Spring Valley to include some unincorporated portions of La Mesa and El Cajon. Carlson said Spring Valley is attractive to many businesses because its unincorporated status means no business license is required. Only health-related businesses and massage parlors are required to hold business licenses. The county Board of Supervisors serves as Spring Valley’s local representation.